Standing on a barren land with nothing but hard stone boulders on it he saw a dream. A dream of changing that land and giving life to it. He had faith, even the boulders generated vibrations of energy for him. He planted one lac saplings. The dry brown face of the earth changed. Birds, squirrels and butterflies started nestling there, playing music of life. When he saw a barren land he planted saplings of trees, when he saw barren hearts the poems poured from his pen. 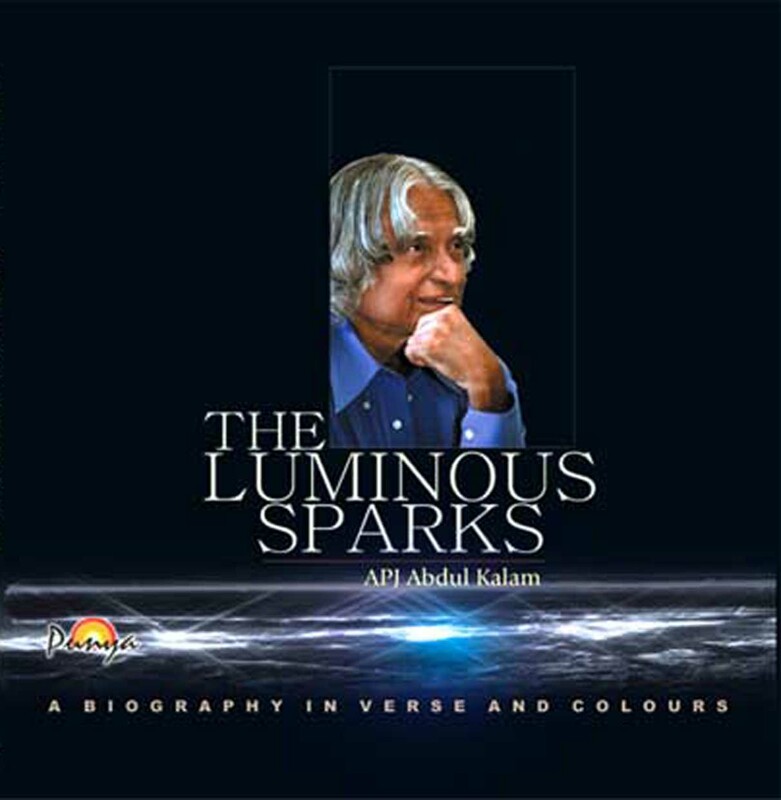 The Luminous Sparks, the collection of selected poems of A P J Abdul kalam are poet’s saplings of love meant to change the hearts – sparks to ignite the inner divinity. A hidden energy vibrates in the lines of the poems. Poems are as simple and ideas as transparent as is the personna of the poet. The transparent personna and simple but inspiring thoughts are the first lesson of leadership that flow to the reader from the poems. The saint and the scientist in him go hand in hand and reach the mystic heights. The human walls of separatism melt and bring forth the song of harmony – ‘ Harmony knows only delight of creator’ – Sometimes the innocent tears shimmer and other times the righteous anger roars and calls those who sow the venom of separatism as ‘ educated serpents ‘. Ever concerned about universal happiness, he gives a message of ideal leadership that his innocent eyes had observed in that naked Fakir, Mahatma Gandhi, who was always there ‘where there was pain’. Leader is not an embodiment of selfishness. He/she is a person with ‘elevated thinking and concern for humanbeings’. His deep love for the country inspires him to have a second vision for the ‘developing nation’ to become a ‘developed nation’. He inspires a strong sense of national responsibility, urging for thoughts to turn into actions with sincere hardwork. The poems are very spontaneous. There is an innocence and simplicity that one does not find elsewhere. The poet transcends the body and his heart comes in union with the buds and soft petals, creepers and trees, dust and blades of grass. The walls between poet and nature dissolve and we see him listening to the buds and flowers, sharing their joys and sorrows. In the whispers of buds we hear our own voice asking eternal questions and getting mystic answers. One does not know where the line between a poet and a saint and poetry and spirituality dissolve. A tremendous conviction in calm and steady unselfish work gets reflected in the wisdom of mother flower who laughs at the tense, restless buds craving for care, appreciation and security. Do not be affected by the external circumstances, blame or praise, by transient nature of your life or human greed. O bud you must open and spread fragrance of love, compassion and kindness. Nature’s drama goes on in the poems, the bud cries why should I bloom to be destroyed? Yet the inner wisdom says ‘bloom you must’ because that is your inner nature — to soothe, give peace and solace. There is a conflict, between an urge to withdraw and the call of duty. Finally the thoughts of swadharma win and spring forth. Reflect your true nature, says the mother to the bud, bloom and be an oasis to the dry hearts so that seeing you the love, kindness and peace blooms all around. The greatest truth to be known is the origin and sustenance of the universe. Today’s matter of fact generation needs to ask these questions and discover their answers in nature that always gives and expects nothing. If the universe has to last for ‘billions and billions’ of years then it should learn the lesson of giving, which is the essence of life. Profound and simple, …. you stop and think … want the words to seep in your soul and reflect in life. These poems of President A P J Abdul Kalam are the divine drops of dew that fall on the blades of grass and start reflecting back a rainbow of pristine colours. When the creativity of colours joins with reflections of a mystic mind they create a symphony that evokes the divine and gentle music of the mind. This is what happens in the pages of Luminous Sparks which both inspire and soothe the mind.